When shipping a car, you can choose what kind of trailer you want to move it in. Philadelphia Car Transport offers two kinds of car shipping: open and enclosed auto transport. 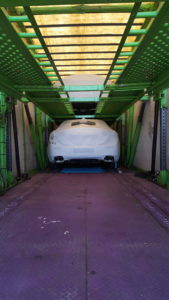 If you are looking to ship for a cheaper price and just need regular car transport, shipping a car in an open trailer is the perfect choice for you. But it can happen that your car requires more than that. If you need to move a luxury or exotic car, you should consider shipping it in an enclosed trailer. This provides the best protection during the process of transportation. We offer enclosed auto shipping to help our clients move their sports cars or any other vehicles that need extra protection during shipping. It is a more expensive option but it ensures the absolute safety of your vehicle. With open auto transport, you would expect some road dust, dirt or flies on your car. However, when you ship in an enclosed trailer, your vehicle will reach you in perfect condition. The walls of the trailer will protect your car from bad weather, rough roads, and all kinds of dirt. Our company also provides shipping in an enclosed trailer with Philadelphia exotic auto transport. If you ship a special vehicle, you want it to be treated in a special way. Our professional team will take great care of your exotic car and make sure it gets to you following the highest standards of safety. We work with the most experienced drivers and take care of scheduling and logistics so you get your car in time. Get free quotes for your Philadelphia auto transport and ship safely and affordably! Request a free estimate through our website or call our office during normal business hours.